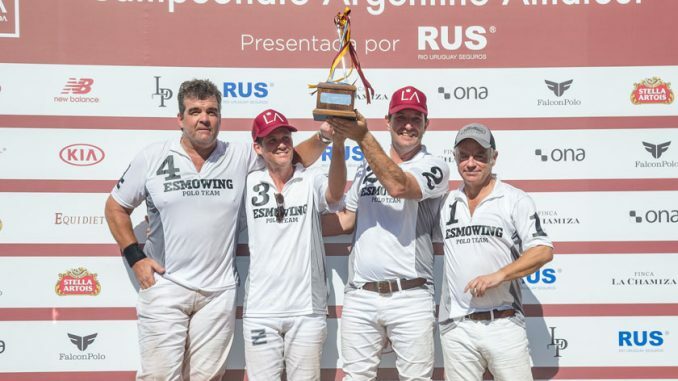 Esmowing beat Libres del Sur by a narrow 10,5 – 9, and claimed the V Argentine Amateur Championship, presented by Río Uruguay Seguros, the opening tournament of the 2019 Autumn Season at La Aguada Polo Club, in Open Door, Argentina. The final was held at the Novillo Astrada family’s club, and Esmowing received 0,5 goal on handicap. 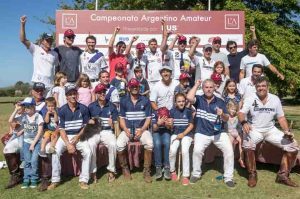 The event was held under the brand new amateur handicaps, rencently established by the Argentine Polo Association. Therefore, the tournament featured teams up to 24 goals. Following the awards presentation, players, sponsors and guests enjoyed an exquisite asado, on a fabulous sunny Autumn Sunday, a great day with several activities for kids and families; the true spirit and the values of the Amateur Tournament – to encourage family, friends and the good times of the third time, in a relaxed and fun entourage. We are very grateful to all the players and teams who participated; to our sponsors – KIA, Río Uruguay Seguros, New Balance, Ona Polo, Logi Polo, Falcon Polo, Finca La Chamiza, Stella Artois, Equidiet – for the constant support; and to all our friends who came to La Aguada to spend a great time. Thank you to all, you are always very welcome!